First up, I can’t miss the chance to wish #theodorbs a very happy second birthday today! 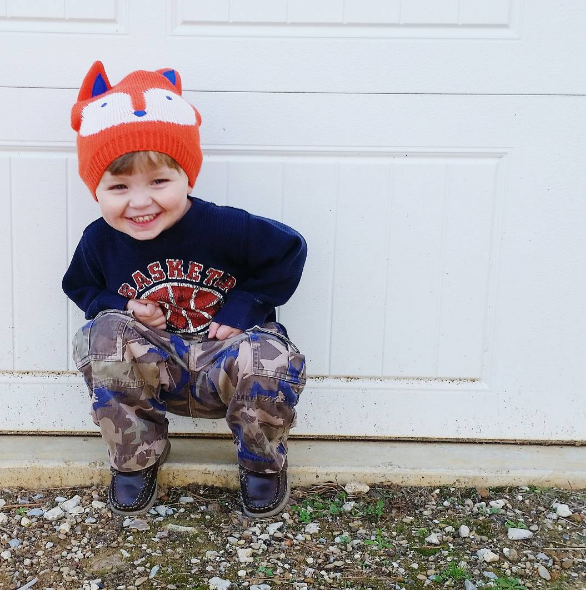 I should just write a blog all about what a joy it is to be his mama, but it would no doubt be an extremely sappy one, especially with my pregnant, hormonal self in charge of the keyboard. Suffice it to say that Theo is a delightful kid. Not all of the time, of course. Hints of the “terrific 2′s,” as Shaun called them the other night, are definitely starting to surface. But, as a rule, it would be hard to imagine a happier, more infectiously sunny kid. Aaaaand it doesn’t hurt that he’s still a wee bit Mama-obsessed, so I get all the best snuggles (I’m sure that will change almost instantaneously once #babynumber7 shows up). ANYhoo, as much as I could just ramble on and on about his sweet, soft voice, the way he says, “Thank ‘ummmm,” and just how precious it is when he giggles into the palms of his hands, I’ll cut myself short and move on to, certainly not a worthier topic, but a less sentimental one. And that would be: wallpaper. I’ve loved wallpaper since before we built our first DIY house. But I’m actually pretty glad that Shaun talked me out of most of the options I was considering when we were first building because I don’t really think I knew who I was design-wise. (Definitely had to learn the hard way that I didn’t want most rooms in the downstairs to be a different color after I repainted, um, well, most of the rooms in the downstairs). 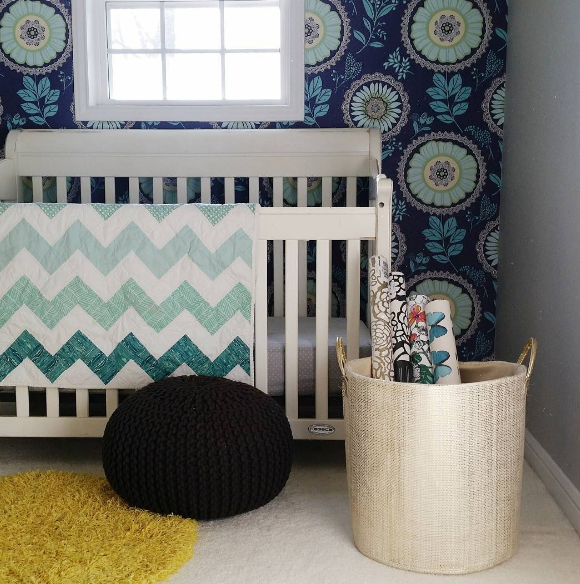 In fact, the only real wallpaper (that Winnie the Pooh border in Ezra’s nursery circa 2006 does not count) that I’ve ever hung is the Amy Butler wallpaper in the twins’ (now Theo’s…no I never did change anything; and no, he’s never seemed to mind) nursery. I still love it more than 4 1/2 years later–an indication to me that I should now be allowed to use wallpaper in the new house, since I apparently know what I like (in this arena, anyway) and haven’t changed my mind about it 40 times. Which! Is why I’ve been snapping up wallpaper deals anytime I run across them. The stuff is expensive, yo. But I’m happy to say that I have yet to pay more than $55 for a roll (that covers 70ish/sq. feet, so we’re talking $0.71/sq. foot). 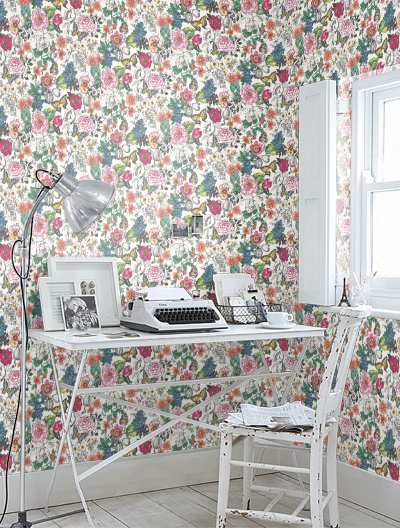 And most of the time, I’ve paid much less (like that time I scored the Petal Pusher wallpaper for $20!). Strangely, most of my best scores have been from Anthropologie, which, while a prohibitively expensive place to shop 90% of the time, is a great source for hard-to-get stuff on clearance. 1. Oh Joy! 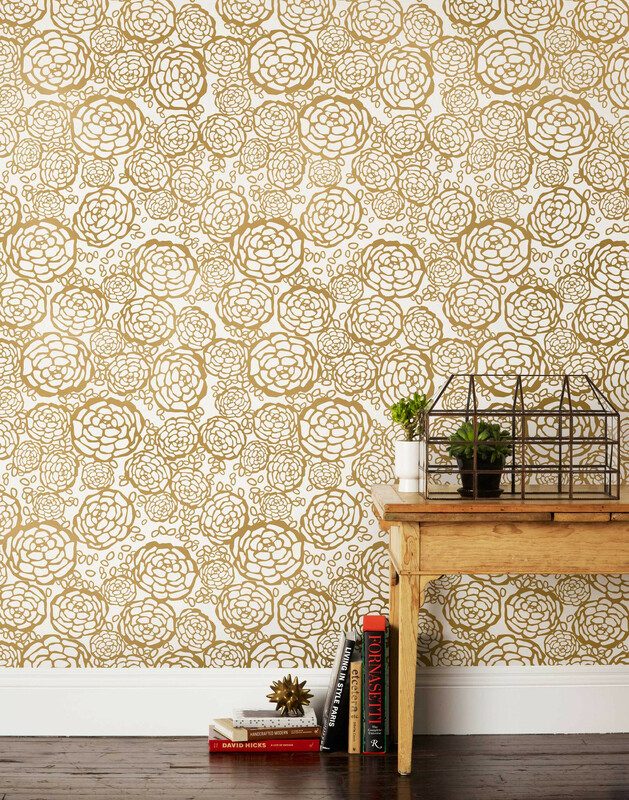 Petal Pusher wallpaper in gold for $20. I plan to use it behind the vanity in the girls’ shared bathroom. 2. The same design in black for $35 (also from Anthro on major clearance; it and the gold above are still available elsewhere for $140/roll). I’ll be putting that one behind the vanity in the main downstairs bath with moody teal cabinetry and brass accents. It’ll go behind the vanity (sensing a theme?) of the downstairs guest half-bath. 4. This Acorus design from wallpaperdirect.com for $55 a roll. (Currently on sale for $41…grrr). It will go on one wall of the master closet and is SO much prettier in person. My sister-in-law saw it and said, “Well, if that just doesn’t scream Abbie!” with a big smile on her face. Ha! She knows me well. 5. 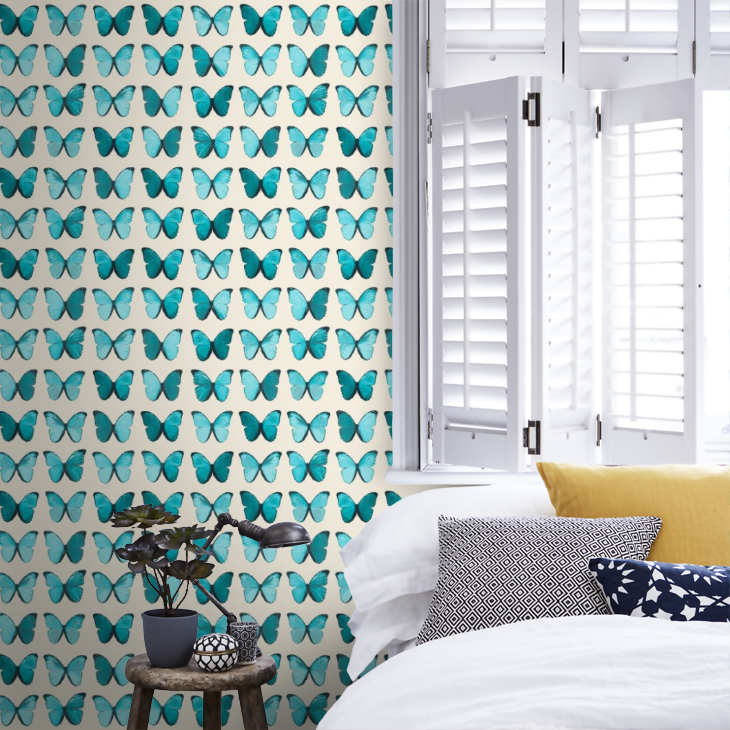 This Papillon wallpaper in teal from wallpaperdirect.com for $20/roll. This one was a really fun score because I’d been wanting to wallpaper one wall of the girls’ play room, but it’s vaulted, which means a lot of space to cover, which means lots of moolah. I’d pretty much given up that “dream,” until I stumbled upon this gorgeous butterfly wallpaper in ivory and teal for only $20/roll. That means that I can do the entire wall for less than $100! And with that, you’re all updated on my wallpaper escapades for the moment, but I have one more I’m working on that you may just have to wait until I get it up on the walls for the big reveal. I know. Try to contain your excitement. So, what do y’all think about wallpaper? I know a lot of people think it’s way too big of a commitment, and I get that. But I find myself willing/excited even to take the plunge on this one. Probably mostly because each one of these choices represents one accent wall in a room, instead of a huge, 4 wall kind of deal. Any cheap/stylish wallpaper resources I’m missing? Happy to hear as always. Abbie, I was wondering *how* you get those awesome deals! Do they go on sale on Anthro’s site every once in a while??? Thank you! I will start stalking for my own deals now. To be a Debbie Downer….are you not worried about the risk of moisture/splashed water in the bathrooms on the paper? It seems like just one wild self-given sink bath by a little one might be all it would take. 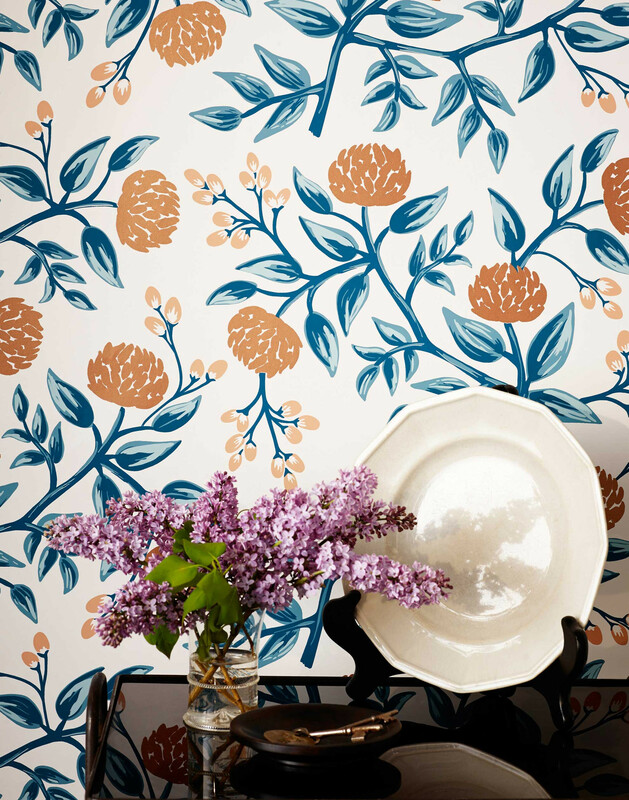 Or maybe wallpaper is super tough and can handle occasional splashes. I have no experience with it. It sure can be gorgeous! I’m not too worried about, no, Rita. You’re right that if the kids REALLY went to town, we’d probably have a problem. But wallpaper these days is pretty hearty, and my kids don’t usually get TOO much on the actual wall (the countertops are a different story). It’s a risk I’m willing to take. Well done! ( On both the wall papers and the price) I wish the butterflies were more “organic” in their layout. I’m beginning to think that Australia is boring, both in the wallpaper and the rug department. You keep finding gorgeous things, while I search and search, to no avail. Theo is scrumptious. Enjoy all the cuddles you can get!!! And Happy New Year. Wallpapering our guest bathroom with a dramatic black-and-white damask print two houses ago is still one of the favorite design moves I’ve made. We’ve just moved to a new house, and I have just the space to do it again! LOVE the gold flowers and wish I’d gotten your deal! 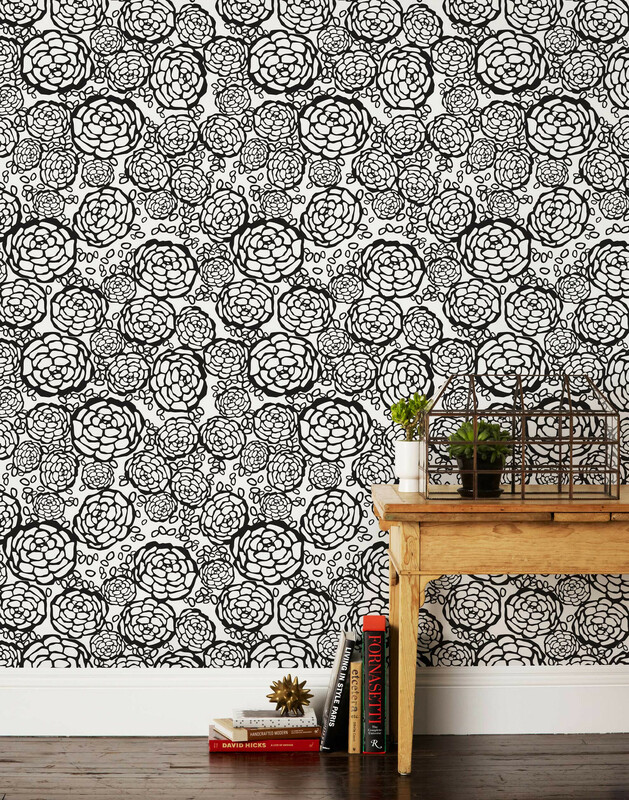 I’m still thinking of all the wallpapers that everyone was desperately trying to rid their homes of the last few years, and it’s just so much work I could never do it! The wallpaper you have chosen is beautiful! I recently did an accent wall with wallpaper in my dining room. The wall features my buffet, which is a dark wood. The wall paper is white with a grey geometric print. In my opinion, it’s a showstopper and everyone tells me how much they love it when they see it for the first time. https://www.bouclair.com/en/12638-Wallpaper-Double-roll.aspx – not sure if they ship to the States (I’m in Canada) but this was my source. I live across the street from the store . Ooh, I like the tree bud paper on that site. Great find! I need to look around there a bit more! Girl, we would get along so well. I love your choices! Those Anthro scores are epic and the butterflies in the play room are going to be captivating!